Our DIY home building kits are among the most popular and easy to assemble on the market today. All of the materials in our home kits, right down to the stainless steel fasteners are made in the USA. Unlike many competitors who source products from China and other countries where durability and product quality control is a major concern, our building materials are manufactured under strict tolerances and attention to detail. We offer traditional Cape Cod style homes designed to fit almost any landscape from the suburbs and country of the northeastern USA throughout the midwest, southern states and west all the way to California. Our traditional Cape Cod designs adhere to the original designs home owners have grown to love throughout the years. We also offer a wide variety of other homes including Victorian styles and Colonial layouts as well. Decking material – standard wood decking is provided with all kits, customers have the option to easily upgrade to composite decking and faux wood polywood style made of recycled plastics for added U.V. resistance and maintenance free durability. Vinyl siding comes standard with the option to upgrade to composite siding, fake rocks or stucco finish. Standard 25 year shingled roofing is standard, with the option to upgrade to steel or tile roofing depending on the climate. All flashing specifications, roof cap venting, and kickout diverters are included. 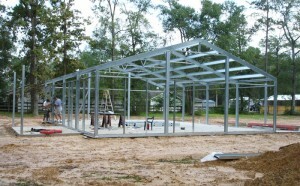 Slab construction is standard with the upgrade option to include a full foundation and basement in some areas. Gas filled vinyl windows are included with most kits. Upgrades include turn style windows, and units with interior blinds. Proper grade suggestions for landscaping and irrigation drainage around the home. Our homes offer a variety of floor layouts to choose from in both the ranch style and tri-level designs. For many outdoorsmen, having an efficient and easy to maintain rustic hunting cabin is an important aspect of any big game hunting season. Having good hunting land to hunt on is one thing, but having a cabin to retreat to after a long day out in the field can really make time with family and friends special and unique. Let’s face it, the last thing you want to deal with is working on a leaky roof, drafty interior, or poor quality windows when you are focused on tagging that monster buck or big old gobbler. We designed our DIY hunting cabins as turn key solutions land owners can construct and use quickly and with very little TLC down the road. Each of our three models of hunting cabins were designed by the staff at HuntingLandWisconsin.com – who have years of experience guiding deer hunts and helping clients find cabins on great Wisconsin hunting land and surrounding states. 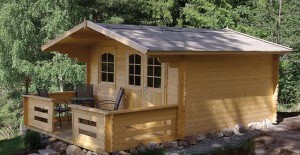 We knew we wanted to design the most practical and user friendly hunting cabins on the market. When we approached the folks at Hunting Land Wisconsin we knew we made the right decision. With years of experience showing clients deer hunting cabins and cottages, they know exactly what people are looking for in a good, solid and easy to maintain hunting camp. Deer hunters want to spend time building tree-stands, planting food plots, and hunting, not tending to the cabin or having to worry about things falling apart. We listened to their advice, and sat down and created what we believe are the best solutions for hunters looking for quick, easy and affordable hunting land cabin options. Each design can be retrofitted with walkout access for placement on hunting land on or near lakes or ponds where waterfowl hunters like to be. All models can also include easy to erect garages and pole buildings for storing hunting gear, ATV’s, boats and other hunting and fishing gear. We can even incorporate things like gun racks compound bow and crossbow hunting racks into entryways. If you’ve got the real estate to hunt on, doesn’t it make sense to have a nice little cabin you can call home and sit back and relax in after each hunt? Pricing on our different cabin designs can be viewed here. We offer both standard pitch and “A-Frame” roofed models for areas where deep snow can be an issue with collapsing roof rafters. Our A-Frame designs are even used by some wardens with the Wisconsin DNR throughout the state. It’s probably no surprise that shipping these kits is a huge pain in the rear and costs a ton of money. UPS or FED EX Ground? Heck no! These things have to ship LTL on freight trucks! Luckily we’ve been working with this realtor in Portage Wisconsin who has agreed to sell these kits for us and make arrangements for pickup at our warehouse. He also lists homes for sale in Pardeeville WI area as well. This is a great way to save money if you own or have access to a pickup truck or can burrow a large trailer like a skid steer or big flatbed that can carry a lot of weight. Contact Us for more info.